T.L. 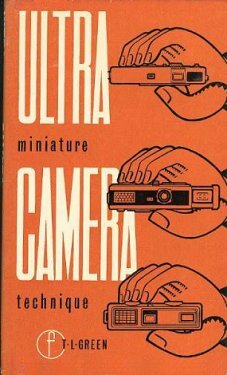 Green's ULTRA miniature CAMERA technique is a comprehensive technique book about subminiature photography; various subminiature cameras were discussed, including Minox, Gami, Edixa, Mikroma, Goldeck and Minolta. Brief history of subminiature photography, film formats, 9.5mm 16mm; why and who uses subminiature cameras. Applications of subminiature in documentation, archaeology, medical and teaching etc. Architecture, Art Galleries, sports, aerial photography, landscape portraits.